The two Hollywood titans relive their infamous on-screen slug-fest. Just like the moon landings, England winning the World Cup and the death of Princess Diana, most people remember where they were when the fight of all fights took place: Ivan Drago versus Rocky Balboa. One was fighting for his country, the other was fighting to avenge the death of his friend, Apollo Creed, who was killed in the ring at the hands of Drago. Okay, so it might have been a fictional bout between two actors in the movie Rocky IV, but if you've seen it you remember exactly how you felt watching it for the very first time, it felt realer than real deal Holyfield. 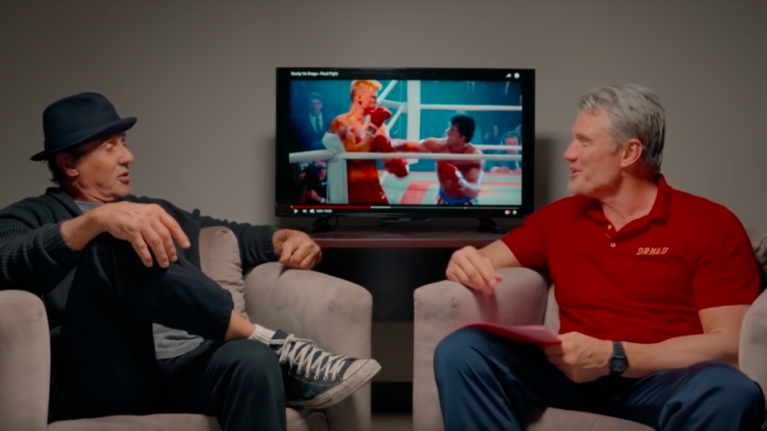 Reliving one of the most brutal fights in movie history, actors Sylvester Stallone and Dolph Lundgren rewind the clock back 33 years and sit together to watch the bout and reminisce on the early days filming it. Discussing how Lundgren was cast, meeting for the first time, the training they endured, the battle in the ring as well as new movie Creed II, which sees the two characters reunite, if you're a fan of Rocky then you're going to enjoy this trip down memory lane.